1/8000sec. to 30sec. (total shutter speed range; available range varies by shooting mode), Bulb, X-sync at 1/200sec. EOS 5D Mark IV Kit : 1/8000sec. to 30sec. (total shutter speed range; available range varies by shooting mode), Bulb, X-sync at 1/200sec. 1/8000sec. to 30sec. (total shutter speed range; available range varies by shooting mode), Bulb, X-sync at 1/200sec. EOS 5D Mark IV : 1/8000sec. to 30sec. (total shutter speed range; available range varies by shooting mode), Bulb, X-sync at 1/200sec. Scene Intelligent Auto: ISO 100 - ISO 12800 set automatically, P, Tv, Av, M, B:	ISO Auto, ISO 100 - ISO 32000 manual setting (in 1/3- or whole-stop increments), and expansion to L (equivalent to ISO 50), H1 (equivalent to ISO 51200), H2 (equivalent to ISO 102400) provided. EOS 5D Mark IV Kit : Scene Intelligent Auto: ISO 100 - ISO 12800 set automatically, P, Tv, Av, M, B:	ISO Auto, ISO 100 - ISO 32000 manual setting (in 1/3- or whole-stop increments), and expansion to L (equivalent to ISO 50), H1 (equivalent to ISO 51200), H2 (equivalent to ISO 102400) provided. Scene Intelligent Auto: ISO 100 - ISO 12800 set automatically, P, Tv, Av, M, B:	ISO Auto, ISO 100 - ISO 32000 manual setting (in 1/3- or whole-stop increments), and expansion to L (equivalent to ISO 50), H1 (equivalent to ISO 51200), H2 (equivalent to ISO 102400) provided. EOS 5D Mark IV : Scene Intelligent Auto: ISO 100 - ISO 12800 set automatically, P, Tv, Av, M, B:	ISO Auto, ISO 100 - ISO 32000 manual setting (in 1/3- or whole-stop increments), and expansion to L (equivalent to ISO 50), H1 (equivalent to ISO 51200), H2 (equivalent to ISO 102400) provided. 3.2 " EOS 5D Mark IV Kit : 3.2 "
3.2 " EOS 5D Mark IV : 3.2 "
Images can be viewed, controlled, and received using a smartphone. Remote control of the camera using a smartphone is possible. Images can be sent to a smartphone. 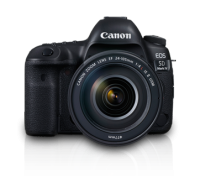 EOS 5D Mark IV Kit : Images can be viewed, controlled, and received using a smartphone. Remote control of the camera using a smartphone is possible. Images can be sent to a smartphone. Images can be viewed, controlled, and received using a smartphone. Remote control of the camera using a smartphone is possible. Images can be sent to a smartphone. 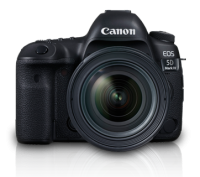 EOS 5D Mark IV : Images can be viewed, controlled, and received using a smartphone. Remote control of the camera using a smartphone is possible. Images can be sent to a smartphone. One file per day, NMEA format *Change in time zone creates another file. *The log data saved in internal memory can be transferred to a card or downloaded to a computer as a log file. EOS 5D Mark IV Kit : One file per day, NMEA format *Change in time zone creates another file. *The log data saved in internal memory can be transferred to a card or downloaded to a computer as a log file. One file per day, NMEA format *Change in time zone creates another file. *The log data saved in internal memory can be transferred to a card or downloaded to a computer as a log file. EOS 5D Mark IV : One file per day, NMEA format *Change in time zone creates another file. *The log data saved in internal memory can be transferred to a card or downloaded to a computer as a log file.